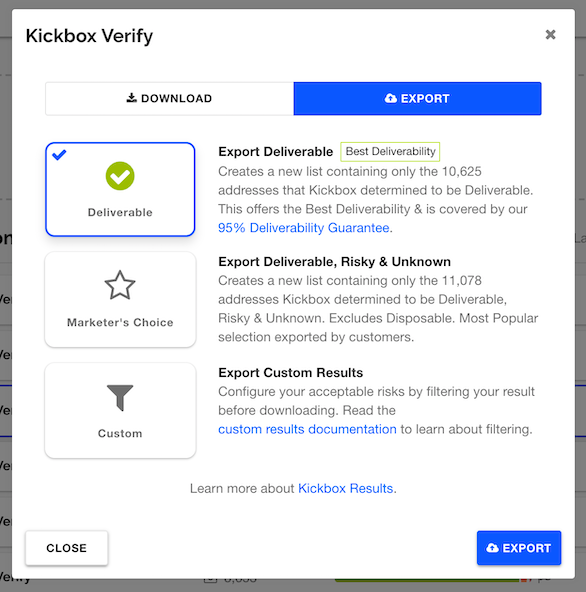 Iterable partners with Kickbox to verify your email lists to determine the good, the bad, and the ugly email addresses on your list—before you hit send. This integration requires an Iterable account and a Kickbox account. If you’re not already an Iterable client, request a demo to discuss how the Iterable and Kickbox integration can work for you. In the Add New Integration modal window, select Iterable. A new window will appear, asking you to add your Iterable API key. 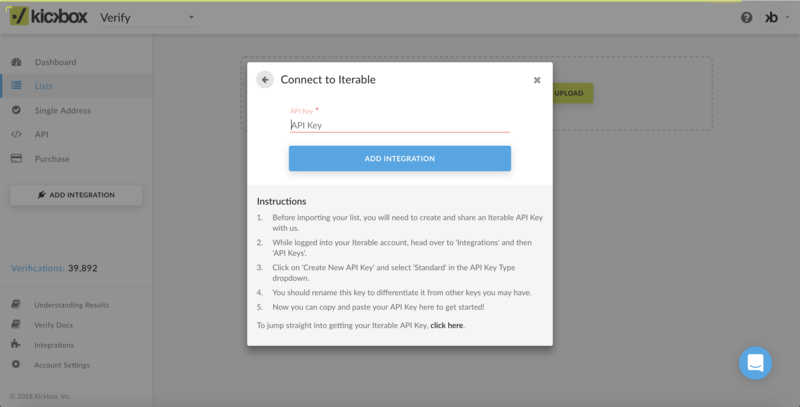 Follow the instructions on this modal to obtain your Iterable API key and paste it into the API Key field. Once you've added your Iterable API key, press the Add Integration button. Your Iterable credentials are never shared with Kickbox. Once authorized, you will see your Iterable email lists appear in your account. Select which lists you would like to import and click Import. Your lists will be imported and analyzed to determine the number of email addresses in the each and then placed in the Active List queue. Click the blue Start List button on each list you’d like to begin processing. You can close the window, turn off your computer, walk away, or otherwise go about your day; you will receive an email notifying you when your lists have been completed. Upon completion, you can navigate back to the Lists page and click on a list to review your results in the right-side panel that appears. The Deliverable tile is selected by default, but you may choose another option. This option will create a new list in your Iterable marketing lists. This list will contain only the deliverable email addresses from your list. Your original list will remain in tact. If you prefer to export your results differently, click the blue Filterbutton to make your unique selections. Once you have made your selection, either the default setting or a custom filter, click Export and allow some time for Kickbox to send this information to Iterable. When the process has completed, you will receive an email letting you know. That’s it! If you have questions about any step in this process, don’t hesitate to reach out to support@iterable.com, help@kickbox.com, or send in a message using the chat bubble below—we’re here to help.